Now writing to bufferes and writing those to the output. Writer class that prints text character by character and interprets simple commands (right now only newlines and changes in speed and pauses). Two days left to Ludum Dare. Good to keep as reference! So far I’m surprised by the speed (the delay you see is actually me pausing the thread)! The last time I tried stuff like this directly in the terminal it flickered like hell. But that time I was using conio.h, this time I write stuff myself using only windows.h. Not very exciting, and now the time is up. Time to hit the bed. Felt good to do some programming anyways. Small progress. 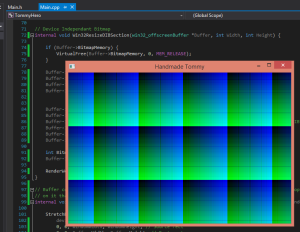 Started porting over my matrix implementations from haxe. At the moment it actually looks more like C-code than C++. Been playing a lot with arrays and pointers. Even some memcpy! Plan is to change from OpenFrameworks later on… but we’ll see. At least the structure will allow it. Currently nothing more than a window that renders the picture above. Spent several hours rewriting my setup code to play with shaders. I also found a library for loading png files from disc, that don’t require you to invoke make-scripts and all that madness. Just add one .h and one .cpp-file to your project and you’re done! The name is LodePNG. However, did not come far enough to read textures into my shader. However I managed to get uniforms working, so I could pass the current time to my shader and animate it. I guess that’s something. Since I became a father of two twins, two months ago, I haven’t been able to do much coding at all. Any opportunity I get I have to make sure I do something really small since my work time gets very fragmented. 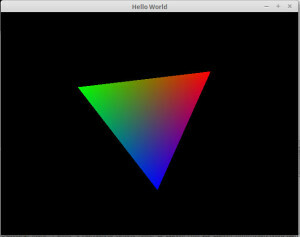 So I started a c++ project, open a window with an openGL context, and started playing with some really basic shader code. As I said, I didn’t get very far before I had to abort. But it’s something. Just wanted to save the links to some pages that helped me setting up GLFW on windows in Visual Studio 1013. Took a short break from the Unity project to go into C++land. 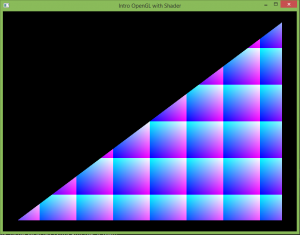 Decided I wanted to play around a little with some C++ and openGL. So, did it go smooth? Not at all. I’ve spent a bit over three days trying to figure out how in *#¤% you manage to tell Code::Blocks how to find and link the libraries I want to use. I’ve covered it in a blog post, mostly for my own convenience. Probably full of incorrectness. Well, now I have a spinning triangle in a window. Time to make something more interesting! Continued with the C++ project. 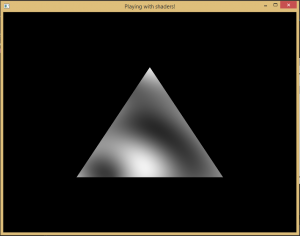 Noticed that the sample code for my triangle was in the older glBegin…glEnd format and changed it to the new opengl 3 standard with shaders, only to get a totally black window. Which gave me a triangle once more. The rest of the evening was spent re-reading about matrix operations, and the Model-View-Projection matrices. It was a long time since I last played around with this. You quickly forget if you do not keep working with it.